We all want to be “on target” with our promotions, right? So what better time of year than Valentine’s Day to show your customers how much you care about zeroing in on exactly what they want and need. Here are a few ways that you can send some business-savvy sentiment straight to the heart of those you most value. If you’ve never sent a Valentine’s Day survey to customers, do so this year. For a fun twist, try a cupid-theme, announcing your “desire to be on target with your service.” A few questions about what customers most seek can be accompanied by a red arrow-shaped pen or giant arrow-styled paper clip. You can also simply thank those who’ve allowed you to deliver them goods and services during this past year. A note expressing your undying devotion to happy customers and appreciation for the opportunity to “hit the bull’s eye” by meeting their needs should strengthen your relationships. Include a lovely silver-plated Cupid’s Heart and Arrow pen/pen stand as a special client gift for the top tier of customers. And don’t forget your employees. Plan an incentive program for the week leading up to Valentine’s Day. Distribute cupid-styled lapel pins for your salespeople or those employees who service the public to wear as a reminder. These can be accompanied by a note card encouraging them to “show the love” to customers during the specified time frame. Those staffers who receive the most positive customer feedback or generate the most sales during the week will receive an incentive gift. Finally, use the holiday to acknowledge your team. A little heart-shaped tin of mints with your company logo and the words “thank you” is great way to start an employee’s day. 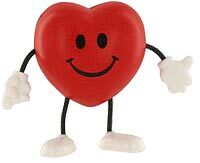 Or distribute small cupid-styled bean bags or stress relievers with the message that the employees are the heart of your company. Such sentimental expressions are valued and always appreciated during Valentine’s Day. So sharpen your cupid’s arrow and we’ll help you aim for the best results. Just call us at 708-478-8222 or send us an e-mail!